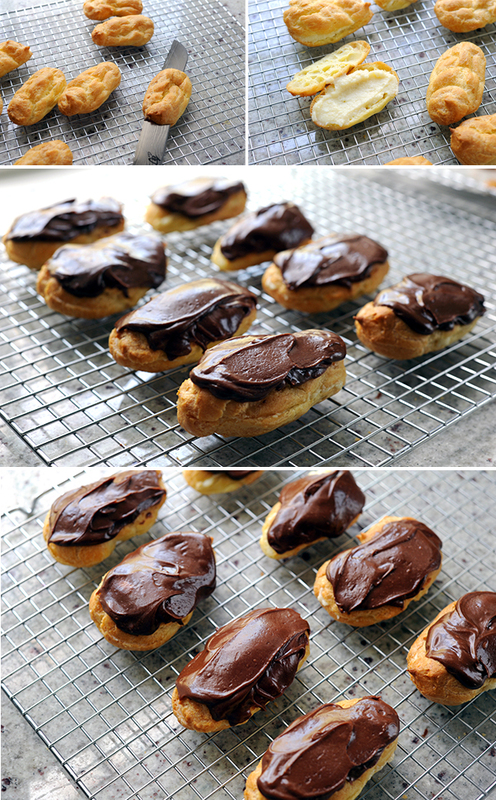 These chocolate eclairs are one of our family's absolute favorite desserts. My mom taught me how to make them (like a lot of the recipes on this blog) and I have to tell you, they take a little practice to make sure they come out perfect. The key? The more you make them, the more you get the hang of the correct consistency of the 3 different batters (dough for the choux pastry, the custard filling and the chocolate icing). I decided to make them into the shape of swans in honor of the "12 Days of Christmas' seven swans a swimming." They turned out so cute! A real show-stoper. To make them into swans, I used a piping bag to pipe their neck and heads by making a "S" shape and then piped their bodies (to be cut open and filled with cream). I used sweetened whipped cream to fill the swan eclairs (rather than the traditional custard) because I wanted the filling to stand up and create a three dimensional body. I sliced the top off the choux pastry at an angle to create wings and then topped them with the chocolate icing and added the swan necks. Now, I also made my regular chocolate eclairs because I knew that Jacobs wouldn't be impressed with my little swans (plus, I really like the custard). Here's the recipe. Make it. It's worth it. For the pastry, preheat the oven to 450 degrees. Add the butter to the boiling water in a saucepan. Cook over medium heat until the butter is melted, stirring constantly. Add the flour and salt all at once. Cook for 1 minute or until until the mixture becomes smooth and forms a soft ball, stirring constantly. Remove from the heat. Add the eggs one at a time, beating vigorously after each addition. Beat until smooth. For eclairs, use 2 Tablespoons pastry, spreading until a 1x3-inch oblong shape. Bake for 15 minutes. Reduce the oven temperate to 325 degrees. Bake for 20 to 25 minutes longer. Cool on a wire rack. For the eclair custard filling, mix the sugar, cornstarch and salt in a saucepan. Whisk in the milk, half-and -half and eggs. Bring to a boil over medium heat, stirring constantly with a wooden spoon. Remove from the heat. Stir in the vanilla. Cool completely (put bowl in a ice bath to speed up cooling). Split each eclair lengthwise with a serrated knife. Fill with the custard. For the eclair chocolate icing, combine the chocolate, water, butter and salt in a saucepan. Cook over medium heat until the chocolate and butter are melted. Remove from the heat. Whisk in the confectioners' sugar and vanilla until smooth. Spread over the eclairs. For the sweetened whipped cream, beat the cream in a mixing bowl to the desired consistency. Beat in the confectioners' sugar and vanilla. Split each eclair lengthwise with a serrated knife. Fill with the whipped cream with a pipping bag.